South American cities are world leaders in urban cable transport, with 24 urban gondolas either opened or planned in Bogotá, Caracas, Guayaquil, La Paz, Lima, Medellín and Rio de Janeiro. I’ve written extensively about La Paz, Bolivia’s capital that went all in on cable transport with eleven gondolas either operating, under construction or planned. But a full decade before the creation of Mi Teleférico in La Paz, Metro de Medellín opened the first of three Metrocable gondola lines in Colombia’s third largest city. Metrocable Line K was the first urban gondola to seamlessly link with a subway anywhere in the world, providing under-served and poor neighborhoods access to the city’s transport network. 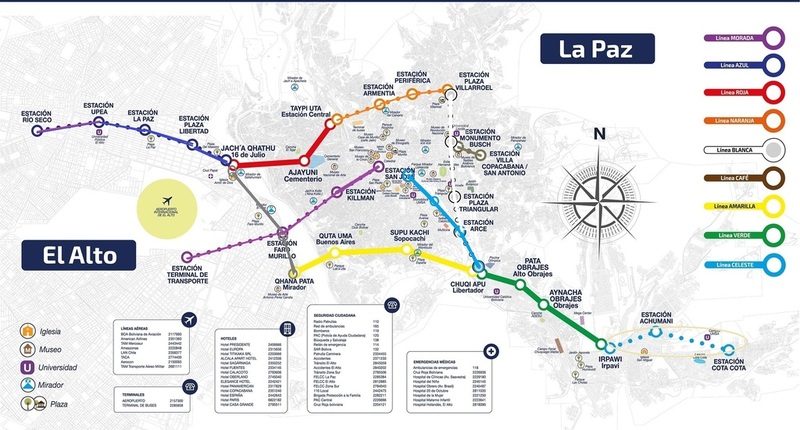 Metrocable’s J, K and L lines, with ten stations over 5.8 miles, now compose a quarter of the Metro de Medellín network. All three Metrocable lines are 8-passenger monocable gondolas built by Poma. Line K debuted in 2004 with a shockingly low construction cost of $26 million. Its four stations branch off from the Acevedo Metro station over a length of 6,798 feet, giving three neighborhoods access to the core subway Line A that opened in 1996. This gondola rises 1,309 feet with a rope speed of 5 m/s. Metrocable Line J opened in 2008 at a cost of $47.5 million, serving four more stations from the terminus of the shorter subway Line B. Line J is longer than the original K at just under 9,000 feet. A ride with seamless transfers between buses, two Metro subway lines and two Metrocable lines costs less than a dollar. Medellín’s Metro system features two subway lines and three Metrocable lines with two more under construction. The first D-Line chairlift will open at Hochfügen, Austria with Doppelmayr’s new, wider six-passenger chairs for 2016-17. Four lifts from the defunct Talisman Mountain Resort in Ontario are up for sale on Resort Boneyard: A 1968 Hall double, 1987 Frankenlift quad, 1987 Poma triple and 1991 BM Lifts quad. A fifth chairlift is noticeably absent. Leitner and Aguido complete the world’s longest conveyor ropeway stretching 4.3 miles in Brazil. 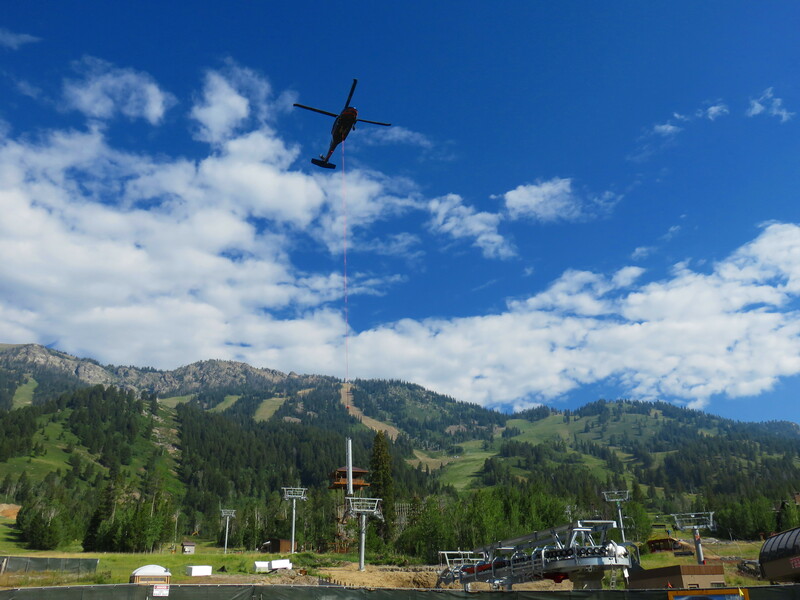 Progress report and photos from the two new lift projects at Big Sky. Cannon Mountain’s board discusses moving the Brookside triple to The Banshees area. The new six-pack at Le Relais looks sharp in gray. Sigma’s new gondola cabin is reportedly called the Symphony 10. The entire 2016 Jägerndorfer Collection model ski lift line is now available in the States. Group proposes Sea to Sky-style gondola attraction in Nelson, BC. Every Tuesday, we pick our favorite Instagram photos from around the lift world. 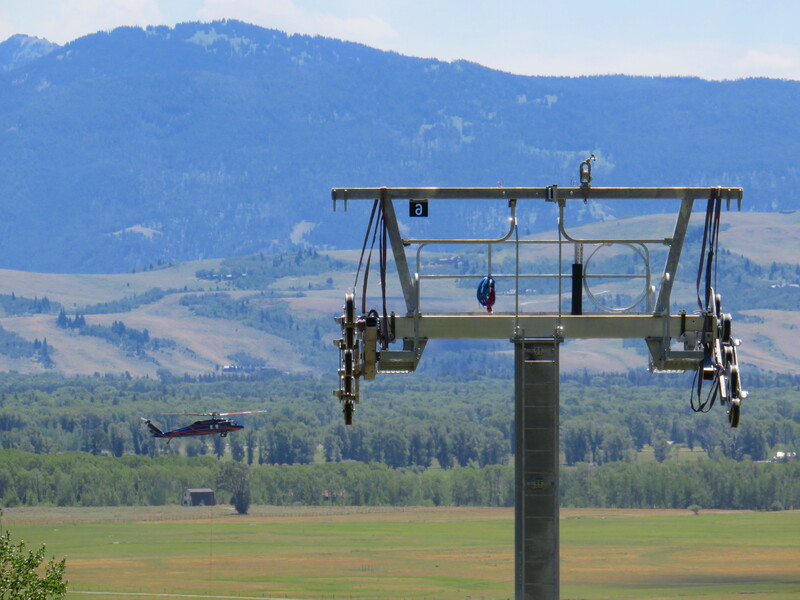 Teams from Doppelmayr and Timberline Helicopters put on a show yesterday in Teton Village as they flew 21 towers for JHMR’s new Sweetwater Gondola. 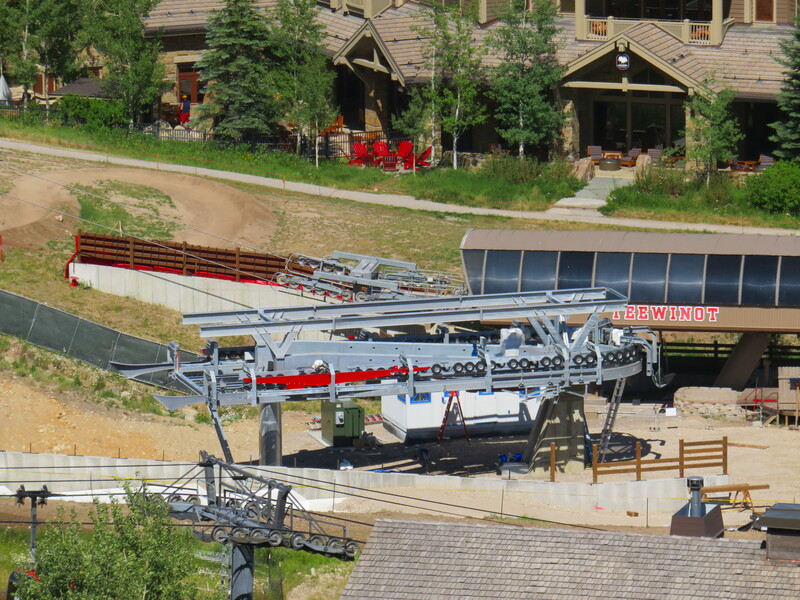 The new gondola rises out of the base area with a mid-station at Solitude and tops out next to Casper Restaurant. With each tower flown in 4-6 sections, Brian and his co-pilot completed somewhere around a hundred laps up the hill over six hours using a UH-60 Black Hawk. There’s still a lot of work to go before November 24th but Sweetwater is starting to look like a lift! Designer Jared Ficklin talks about his dream for urban cable in Austin. More details surface regarding Aspen Mountain’s replacement 1A lift. The Yellowstone Club unveils plans for The Village, anchored by a new Eglise Gondola and high speed quad. Vail Resorts’ Canyons Village Master Plan includes a strategic new Sunrise lift providing access to the Quicksilver Gondola. Peak Resorts lost $3.2 million last year and will not make any major capital investments at its 14 mountains in 2017. Another Yan detachable has found its way to Iran. Doppelmayr may build another urban gondola project in The Philippines, this one in the southern city of Davao. 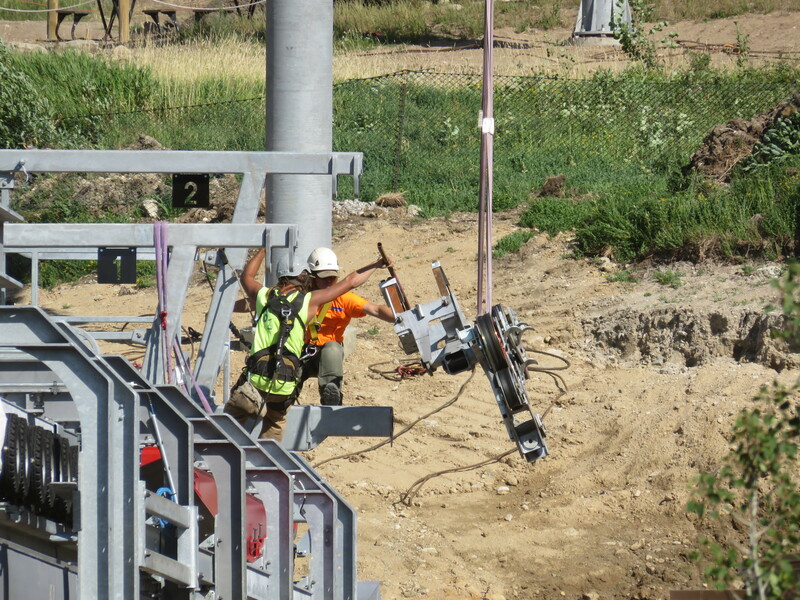 Caberfae Peaks is nearly finished building its new chairlift. Sunday River’s insurance company indicates a failure of the grout that secured the top terminal to bedrock caused last week’s failure. 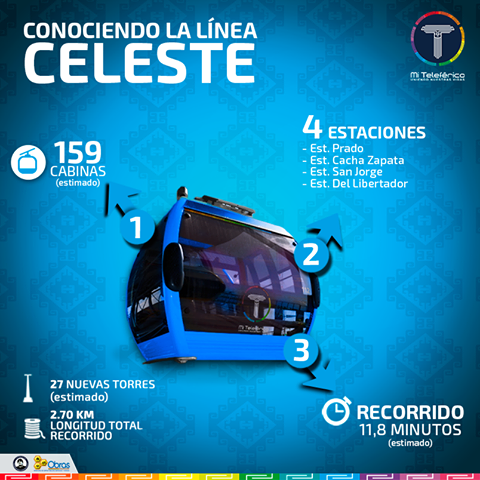 The urban ropeway revolution will continue in Bolivia’s capital city of La Paz, where President Evo Morales announced Friday an 11th gondola line, Linea Celeste (Sky Blue Line) will join the Mi Teleférico gondola network. La Paz and the neighboring city of El Alto announced the Red, Yellow and Green gondola lines in 2012 and the world’s largest urban gondola system opened throughout 2014. President Morales unveiled plans for phase two with six more lines in 2015 with another added to the mix last February. All 11 lines will be 10-passenger monocable detachable gondolas built by Doppelmayr. This latest investment of $110 million comes on top of $234 million for phase one and $450 million for the first six lines of phase two. 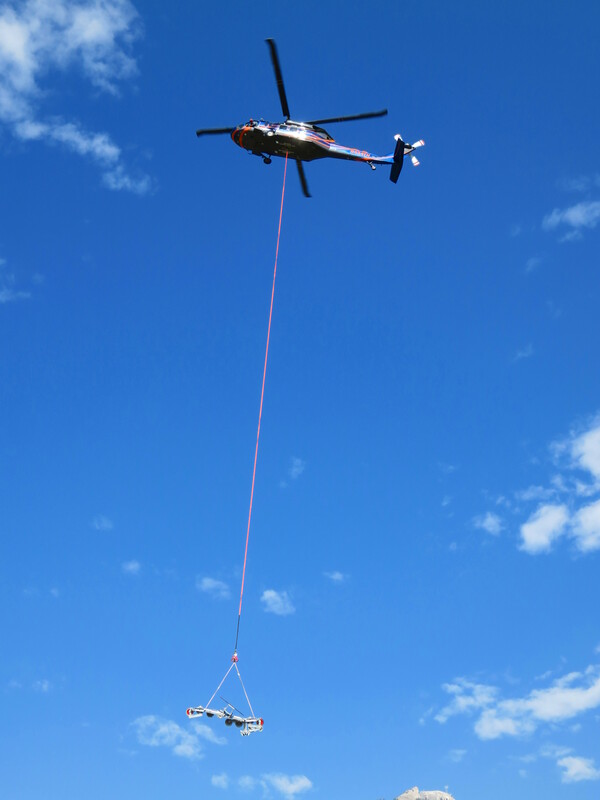 The Sky Blue branch will stretch nearly 9,000 linear feet with four stations, 27 towers and 159 CWA 10-passenger cabins. It is expected to be the busiest line in the system, serving the heart of the city and up to 4,000 passengers per hour at six meters per second. The three existing lines operate at up to 5 m/s. A trip from end to end on Linea Cileste will take 11.8 minutes. A line previously dubbed Sky Blue will now be known as the Gold Line. At the current rate, Mi Teleférico is going to run out of colors soon! Cherry Peak’s third triple chair will reach 7,050 feet in elevation, significantly higher than the Vista lift to the right. Utah’s 14 ski resorts have built more than 45 new lifts since Salt Lake City hosted the 2002 Winter Olympics, barely behind Colorado over the same period, which has twice as many mountains. Ski Utah is a huge success story in an era which has seen dozens of resort closings nationwide. Cherry Peak Resort became the state’s newest winter destination last December, bringing affordable skiing to the Cache Valley and the nearby college town of Logan. 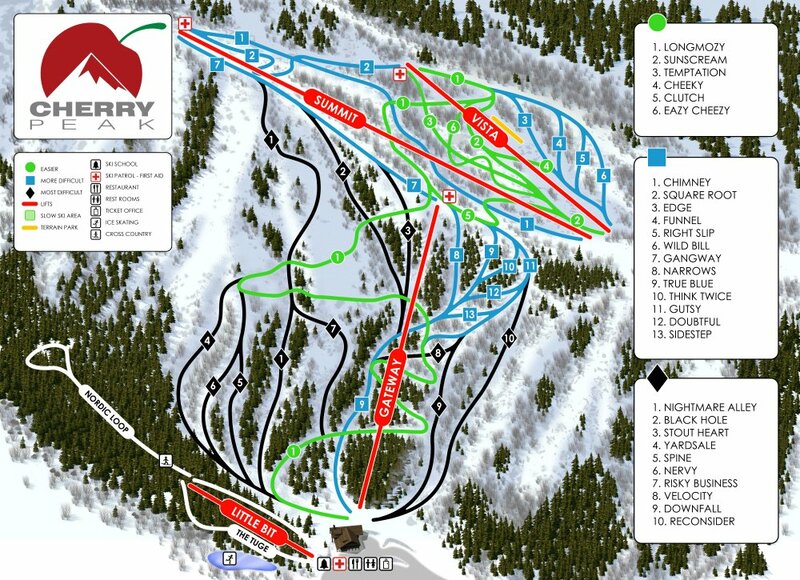 Cherry Peak is the first all-new ski facility in America since the 2004 opening of Tamarack Resort in Idaho. 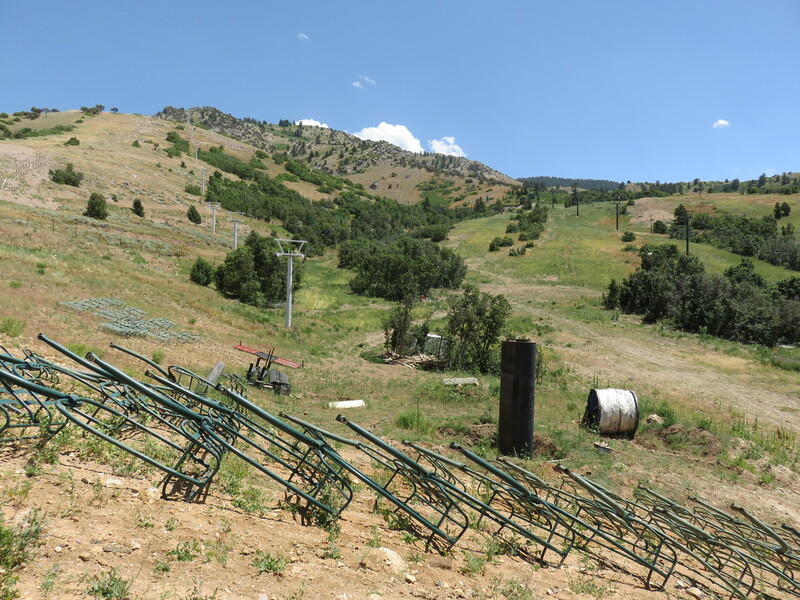 Next winter, the mountain will debut a third chairlift, increasing lift-served vertical rise to 1,265 feet. Cherry Peak has a unique business model for the Rockies, operating Monday-Saturday with a noon opening on weekdays and skiing until 10:00 pm. Owner John Chadwick has a lot to be proud of since starting construction on the project from scratch in 2013, completing a road network, two lifts, night lighting, snowmaking, a beautiful lodge, tube park and more. Last season saw plentiful snow and more than three months of operation with two triple chairlifts and a magic carpet. 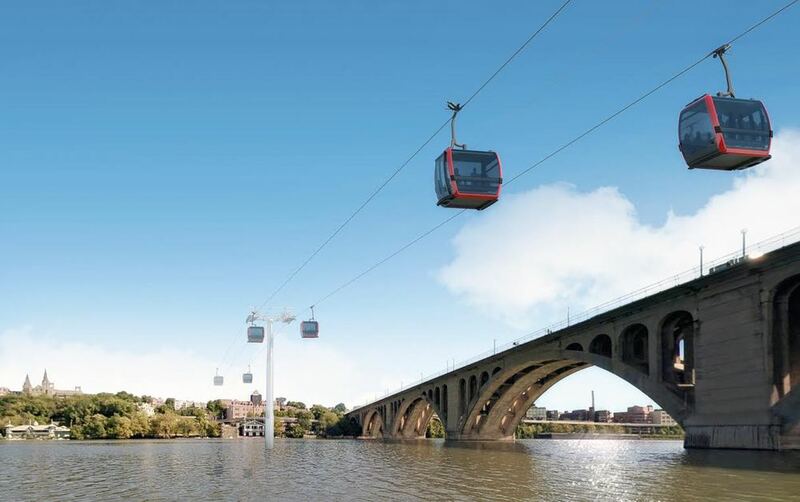 ZGF Architects will lead a team of professionals to study a possible gondola link between the Georgetown neighborhood in D.C. and Rosslyn, Virginia. Washington, D.C. is inching closer to building the first urban transit gondola in the nation. A team of consultants let by ZGF Architects held an open house last week to update the public on the feasibility study underway for the Georgetown-Rosslyn Gondola proposed to cross the Potomac River. ZGF, whose mission is to “create beautiful spaces that best serve people and the community,” was chosen this spring from eight teams who bid on the study. Local governments, Georgetown University and private-sector businesses have dedicated $190,000 to the project to date. 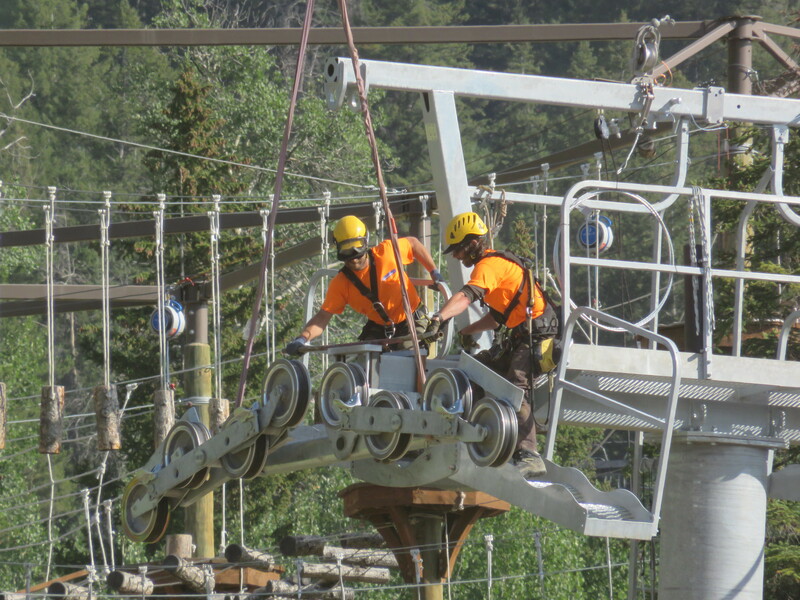 Jamie Bunch and Mike Deiparine from Engineering Specialties Group will provide technical ropeway expertise. 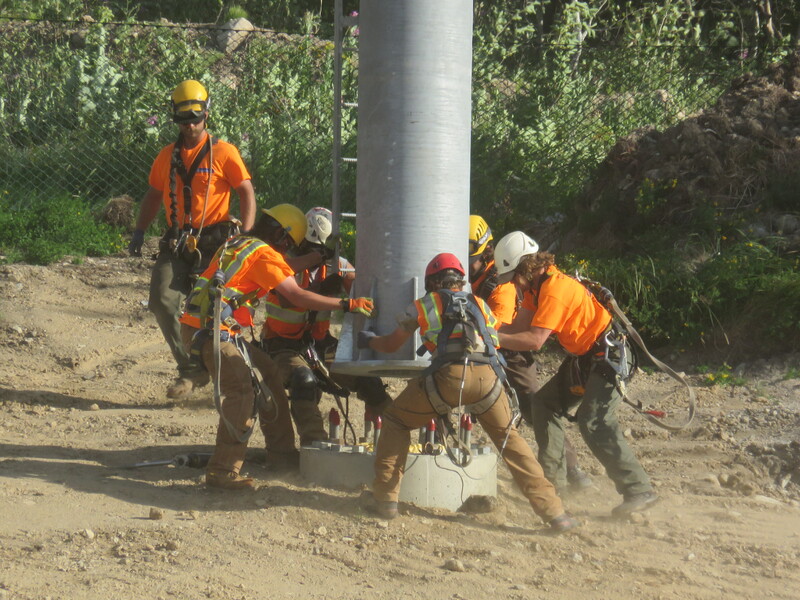 Their company has vast experience consulting on projects such as the Telluride Mountain Village Gondola, Portland Aerial Tram, Roosevelt Island Tramway, Steamboat Silver Bullet Gondola and the Jackson Hole Tram Replacement. ZGF Architects and its partners will study the gondola’s possible routing and overall feasibility, releasing their findings this fall. 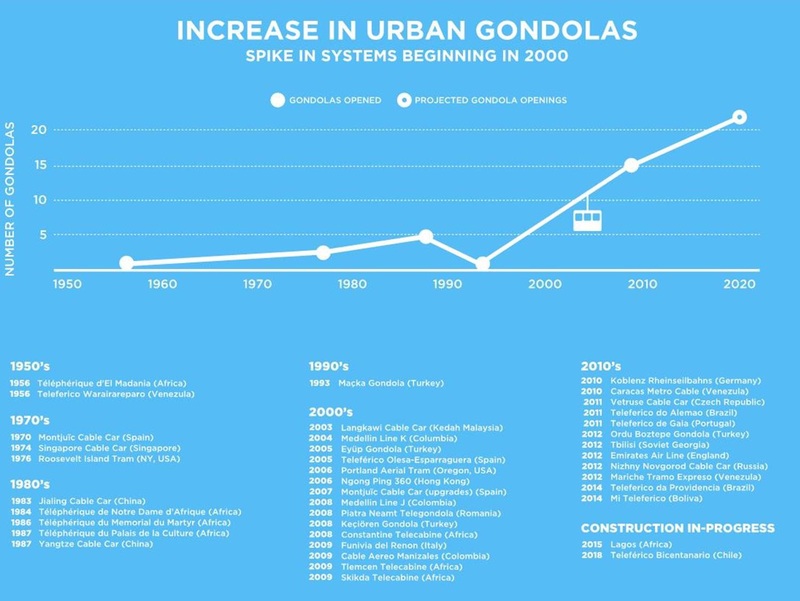 Staff presented this graphic showing the rapid growth of gondolas in cities across the globe. At the meeting, project staff presented a Gondola 101 primer and chronicled the rise of urban cable transport globally. The presentation even included pictures from my lift database! Slides were impressively researched and something I wish every American city-dweller could sit through – explaining angle stations, towers and cabin spacing in an easy to understand way. Staff detailed four case studies: the Portland Aerial Tram, Roosevelt Island Tramway, Emirates Air Line and South American systems in La Paz and Medellín. After the formal program, community members got to check out five stations with display boards and ask questions. The new Sweetwater Gondola return terminal seen from the tram on July 13th. 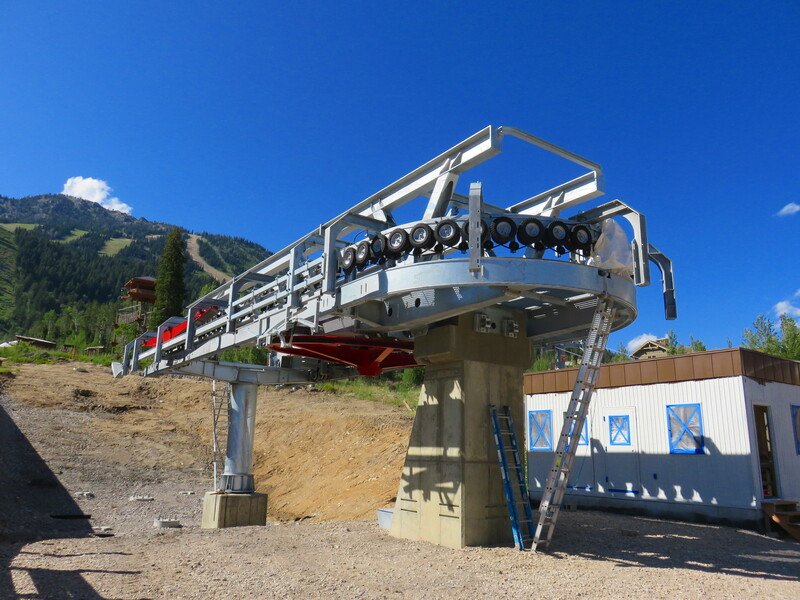 A lot has fallen into place since my last update on the new Sweetwater Gondola going in at Jackson Hole, the only new gondola at a North American ski resort for 2016. All three terminal sites required significant excavation and utility relocation which is largely complete. A crane set all of the big steel at the bottom terminal last Thursday and Friday. The station is nowhere near as big as the Bridger Gondola’s, which was designed for a rope speed of 1,200 fpm nearly 20 years ago (Sweetwater has a design speed of 800 fpm.) It is significantly longer and taller than the Teewinot quad next door, however. Sweetwater’s custom bottom terminal skin will arrive from Austria later this summer. Return terminal and operator house in progress. Line gauge bullwheel seen from below. All 21 towers arrived in sections from Salt Lake City in early July and will be flown in place at the end of the month next Wednesday. 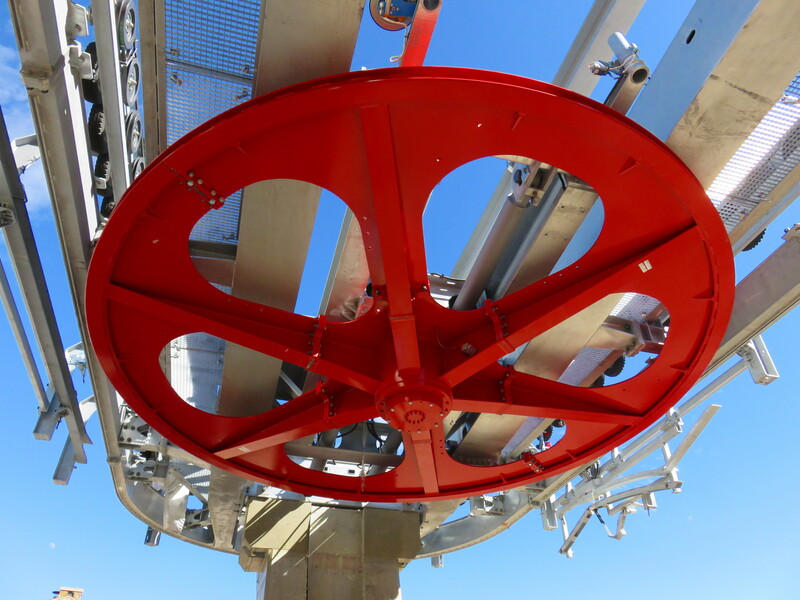 The lifting frames are the “American style” rather than the Euro-style ones Doppelmayr uses on some large gondolas. All the tower foundations are finished and ready for fly day.